It’s almost time for the big game and I am excited. Noah really isn’t in to football but I still like watching games with him. I like to get some of our favorite snacks and make it fun. I learned about an app called GridFL that combines football and bingo. You play live while watching the game. Noah and I both love to play bingo. We played together for the first time years ago. Bingo is so fun and exciting. You don’t know who will win. Football Bingo includes all the things that happen during a football game. You earn bonuses by marking four squares or by getting a bingo. With the bonuses, you can also force another player to take a time out. Just like the football players, they can’t mark their card for sixty seconds. You can also scramble your card to move three spaces to either improve your chances or make them worse. Another special game move is Scramble where you can give an opponent a new event. 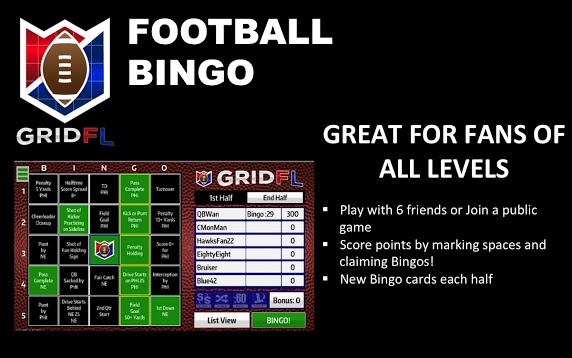 GridFL is a great way to get your whole family involved even if they aren’t really interested in the game. It’s a game within a game. It’s fun and easy. You can all have your own accounts and bingo cards. You do have to have a separate phone for each person. If you don’t have enough phones, you can play on teams. Your first game is free. Additional games are very affordable. You get cards for both halves of the game. You can set up a game and get your friends involved too. You can play with friends and family in the same room or anywhere. It would be fun to include it as a party activity. If you don’t have friends to play with, you can join someone else's game. There isn’t a chat feature so you don’t have to worry about foul language. As a parent, I think that is important. The app is available for both iPhones and Android phones.